What is the Mobile Web, and why should you care? How is the Mobile Web different? "Access to the internet from a mobile device." The term could refer to any use of the internet from a wireless device. We're talking more about use of the web from highly portable, personal devices. By 2011, 85% of handsets will be able to access the Mobile Web. 1) Lots of people are using it. Millions of people are getting set to enter the Mobile Web. "More people will access the mobile web than the desktop web." In 2013 according to Gartner. In 2015 according to Morgan Stanley. A worldwide stat, but the US is catching up. 2) For many people, a mobile device might be all the computing power they need. PC's or something like them will be around for a long time. Launch of the iPad brought up an interesting question: does everyone need a PC? PC at work, mobile device at home? "I'd buy my parents an iPad." Definitely not just the iPad - Tablets going main stream: $99 Android tablet at Walgreens. 3) The Mobile Web is used differently, and we need to re-learn some of our basic assumptions about building web content. The mobile web is frequently used secondary to another activity. I'm stuck on the train: play a game. I'm lost: I need a map. I'm visiting someplace new: What's around me? Mobile devices are much more "personal" than a personal computer. They are always with you. An accessory rather than an appliance. Applications can enchance your mobility. Provides immediate information about your surroundings directly from the owner of the property you are at. 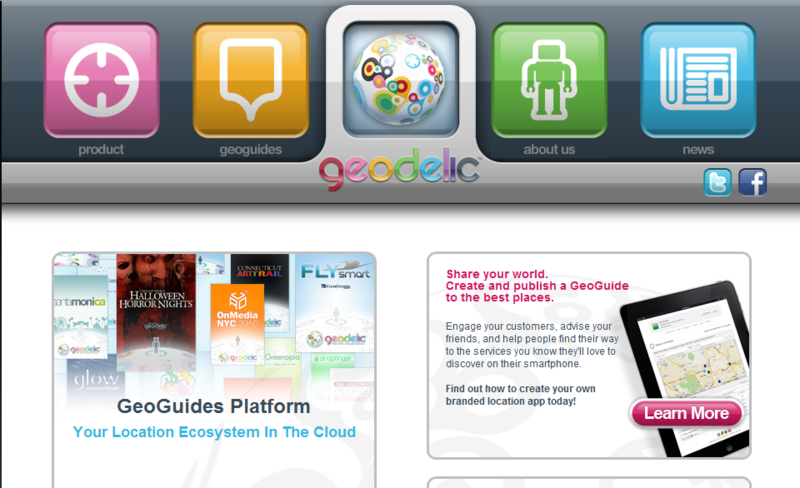 If you are in Disney World, launch Geodelic and receive maps, current even information, and marketing information. Take advantage of advanced features: The GPS "check in." "Check in" where ever you are located. 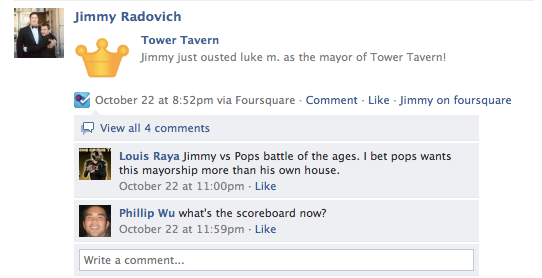 Share your location history with your friends through Facebook and Twitter. 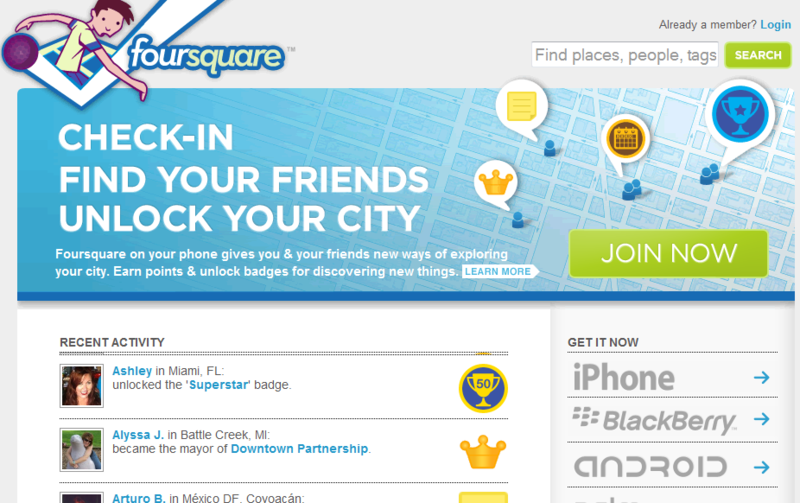 Claim badges and even "mayorship" of locations based on your check in history. The very "personal" nature of the device leads to some surprising use cases. A sensor connected to your wrist measures your sleeping patterns. Connects to your smartphone through bluetooth. 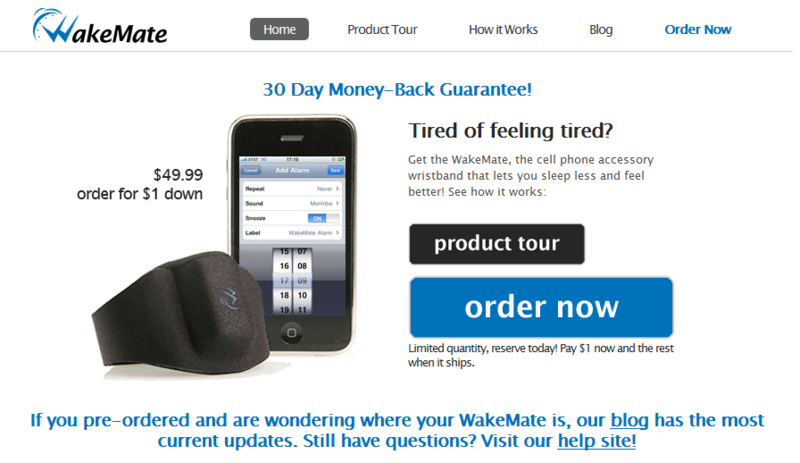 Sends your sleep data to the Wake Mate servers through the web. Produces reports on your sleep patterns and recommendations on how to sleep better. The "always with you" nature of the device leads to some surprising use cases. 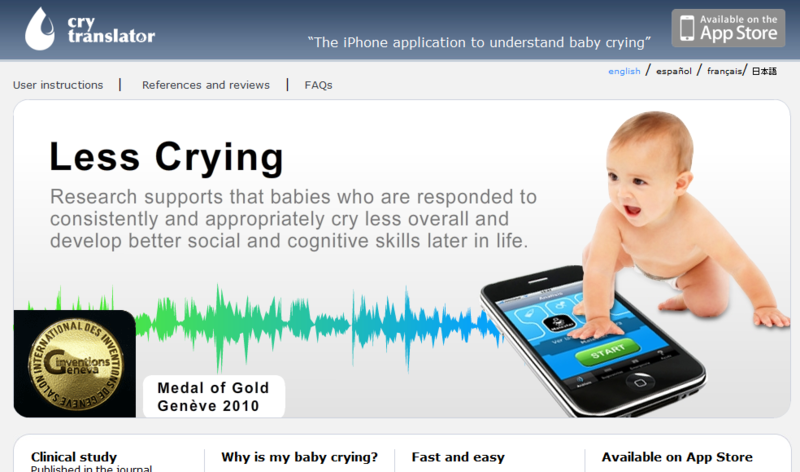 Take a recording of your baby crying with the phone. Recording is relayed to the Cry Translator over the web. The servers attempt to map the vocal patterns to a cause. Online usage increases when consumers have 24x7 access to a product. "There are more than 150 million active users currently accessing Facebook through their mobile devices. People that use Facebook on their mobile devices are twice as active on Facebook than non-mobile users." The Mobile Web is used differently, and we need to re-learn some of our basic assumptions about building web content. 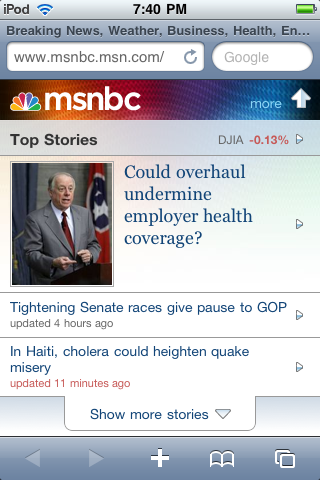 What context are users going to be using your mobile site in? What does your site add to their mobility? Some content is more at home on the desktop web. 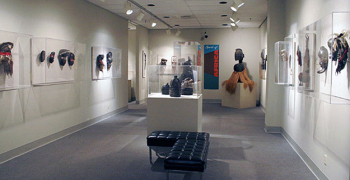 "Museum Style" content: On display, in need of large amounts explanation or context. Things that are impractical or dangerous to "boil down" like in depth research or policy documents. A large percentage of government business. Small: Mindful of small screens and divided attention. Mindful of context: What situation will the user be in when they use this information? More about communication than content: Mobile is a more natural setting for communication. Mobile applications are computer programs built specifically for the mobile environment that they run in. Able to access advanced features features of a phone that web pages cannot (for now). Come with a built in distribution channel. Much heavier duty development process than web pages. Publishing process often controlled by a third party. Large installation base full of heavy users. The iOS SDK includes many well developed User Interface components. Development only possible in a Mac environment. Distribution only possible through App Store. Can be a long process. Apple's Terms of Service still up in the air. App Store demands strict attention to Apple's HIG (Human Interface Guidelines). Open source, mobile operating system sponsored by Google. Many vendors make phones based on Android. Growth also coming from tablets, other devices. Analogous to Apple's App Store. Direct installation is also allowed. Fastest growing system - projected to overtake iOS soon. Status as a "default" smart phone environment might mean less engaged users. SDK includes fewer UI elements. Applications can function and appear differently, could confuse user base. Established disrobution channel (Blackberry App World). Differences in Blackberry models and opperating systems make development challenging. Some enterprise users will be less engaged with mobile apps. Enables use of advanced mobile features (GPS, camera, etc) enabling more advanced applications. More intensive development process than web applications. Less room for "design by committee". Applications are not the only way to have an effective web presence. Any website can be designed in a way that makes it useable on mobile devices. Much lighter weight development and update process as compared to mobile applications. Same distribution channel as existing web sites. A single mobile site can be seen in many browsers. Unable to access some of a mobile devices advanced features (for now). Sites look different in different devices. Hard to design for all of them. 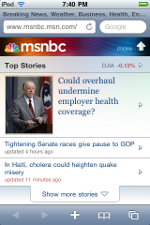 Mobile websites are optimized in content as well as design. Small sized content - both in length and depth of the link structure. 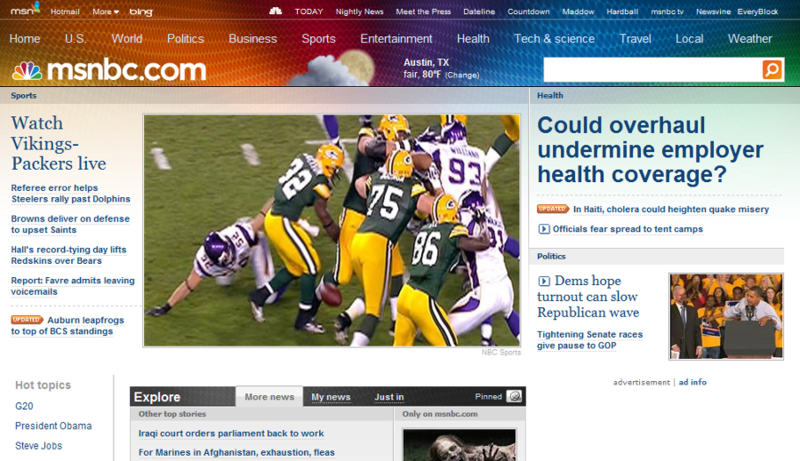 Context: What will the average viewer be using the mobile site for? Communication is more valuable content. Build mobile web sites with the same technologies as desktop web sites. A single mobile site can be seen in almost all devices. Mobile web sites will have the abilities to use all features of mobile devices. Lots of the rational for mobile applications will disapate. Mobile Web Presence: Web Site or Application? How do you expect your audience to use the site? Does building a mobile presence cost effectively advance your mission more than providing open data and API's? Do you need to take advantage of advanced features of a mobile device? Yet another fundamental shift. That's nothing new though, there have been several developments. Web 1.0: Moving content to the web. Web 2.0: an interactive web. The mobile web space shows all the same symptoms of the internet as a whole in the mid 1990s. 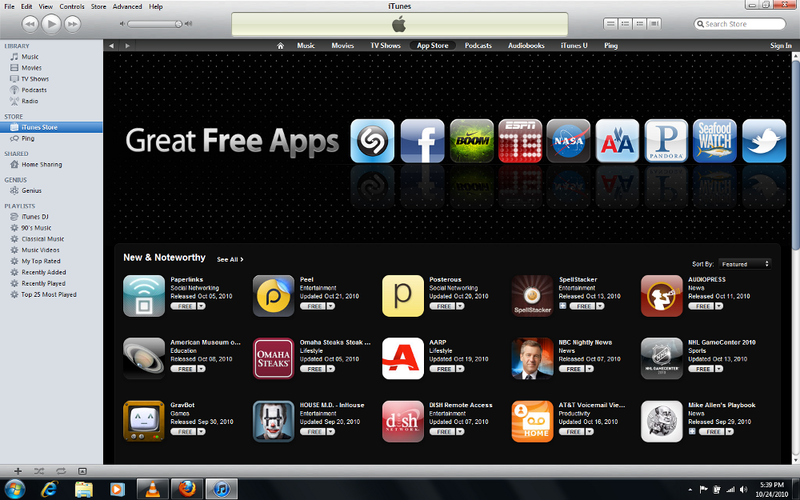 Apple's App Store and the Android marketplace are the AOLs and Compuserves of today. Encapsulate a huge web in one box. Offer to organize and control the mobile web in the name of security and convince. Highly profitable for those that control them. Innovation trumps organization: messy and a little dangerous won before, it will again.